The three pictured galaxies — NGC 7173 (middle left), NCG 7174 (middle right) and NGC 7176 (lower right) — tug at each other, dragging a significant number of stars away from their home galaxies. Three galaxies are playing a game of gravitationaltug-of-war that may result in the eventual demise of one of them. A new NASAHubble Space Telescope image shows the push and pull in action. 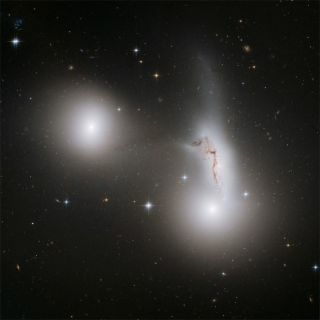 Located about 100 million light-years away in the constellationPiscis Austrinus (the Southern Fish), the galaxy interaction may ultimatelylead to the three reforming into two larger starcities. The three galaxies ? NGC 7173 (middle left), NGC 7174(middle right), and NGC 7176 (lower right) ? are part of Hickson Compact Group90, named after astronomer Paul Hickson, who first cataloged these smallclusters of galaxies in the 1980s. NGC 7173 and NGC 7176 appear to be smooth,normal elliptical galaxies without much gasand dust. In stark contrast, NGC 7174 is a mangled spiral galaxythat appears as though it is being ripped apart by its close neighbors. Thegalaxies are experiencing a strong gravitational interaction, and as a result,a significant number of stars have been ripped awayfrom their home galaxies. These stars are now spread out, forming a tenuousluminous component in the galaxy group. Ultimately, astronomers believe that NGC 7174 will beshredded and only the two "normal" elliptical galaxies (NGC 7173 andNGC 7176) will remain. Hubble imaged these galaxies with the Advanced Camera forSurveys in May 2006.